There’s no doubt about it – London living ain’t cheap. But for me, let’s be honest, it could be cheaper. The boyfriend and I frequently fail to see eye-to-eye when it comes to ‘after work drinks’ locations. He likes a pint down the pub or a glass of wine somewhere nicer (that’s not to say he’s not a classy guy) whereas I prefer a glass of Champagne or a cocktail somewhere REALLY nice. Constantly living beyond my means – that’s me. So it’ll come as no surprise that I’ve spent many a happy evening at the Perrier Jouet Bar on 5th floor of Harvey Nics in Knightsbridge. I do like that bar, the decor has been done really rather well – the reason I say that is because it literally sprung up from nowhere. 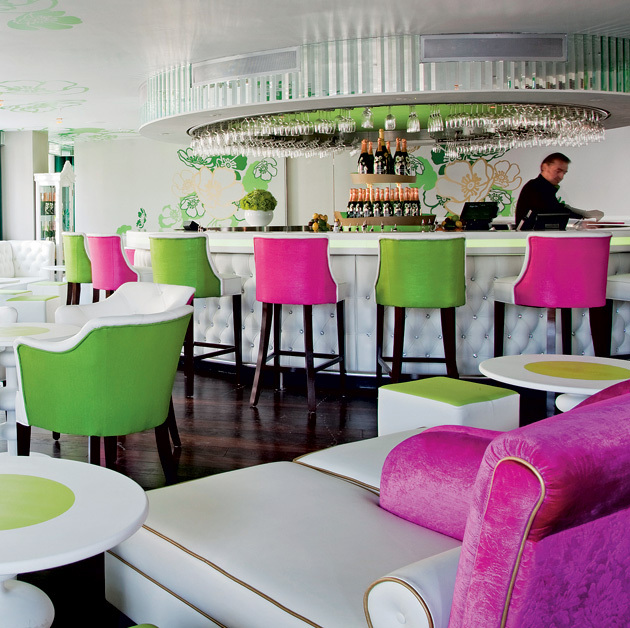 I love the extreme colours next to white floor and bar, and it’s quite comfortable as well. A quick lunch with a bottle of wine isn’t cheap, but their house wine is very quaffable, and the caesar salad was great (except for the anchovies – but then I’m just being picky!) They aren’t trying to sell you any old tat, Harvey Nics wine buyers DO know what they’re doing. The bar staff, now they are good, but they aren’t that good, upon being told, with a cheeky wink, I fix you the best Cosssssmo you ever try, I didn’t hold out much hope – rightly so. Possibly the worst Cosmopolitan complete with an ‘edible’ pansy flower floating in it was placed in front of me, while the barman beamed at me, I forced a sip and a smile as I hastened to the other side of the room. That little episode aside, the atmosphere in the bar is great, it’s got the busy, buz all good wine bars should have, the wine is good, the ‘sightseeing’ isn’t bad either – and to complete the puzzle you can shop til you drop in the same building! I recommend doing this before you head to the bar though – I speak from bitter experience! Overall, a great drinks place to go with the girls, but don’t confuse the barmen with cocktails stick to the wine and Champagne and you’ll have a fab night! The Cosmo bit made me chuckle. We were in Harvey Nics a few months back and a barman (probably the same one) said “I make you very nice appletini with thyme”. The concept was rather strange at the thyme (sorry, couldn’t resist) but it turned out to be surprisingly good. This was a nice prelude to the smoked salmon cocktail I had a Sofitel St James bar a few weeks back. You and Lolli would get along quite well I think. Dreams of champagne lifestyles glisten in front of dazed eyes. I think I could quite happily live a Champagne lifestyle… If only I didn’t have to work for a living! This made me chuckle too. I too live way beyond my means, albeit in much cheaper Leeds, and it has caused a fall-out or two between me and my boyfriend when it comes to drinking establishments! Always interesting to read reviews on bars- especially London as i don’t get the chance to get back much anymore! I bar tend myself in somewhere suitably swanky. We make a couple of silly drinks where i work, but i draw the line at pansies and smoked salmon i’m afraid. It sounds great, i was equally impressed by the bar in Harvey Nicks, Leeds. I’ll put it on my to do list next time i’m home. Love the Harvey Nics in Leeds although the last time I wnt there it was new and I wasn’t old enough to drink so I choose the most expensive dish on the menu – god I must have been an annoying child!! Just had a look at your blog and am seriously excited to try the Strawberry Daquari thingy… looks soooooo good!